If you’re in the Portland area this Thursday evening, come to our next bimonthly meeting to see and hear more from Ted Kaye. And others — bring your own item or story to share! 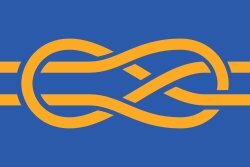 Attending the 26th International Congress of Vexillology (ICV 26) provided an opportunity for travel around Australia and see flags! 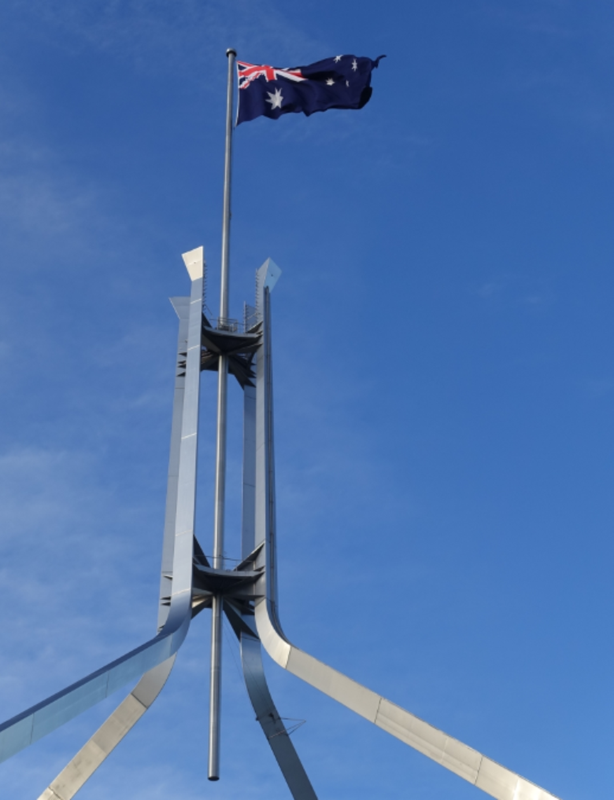 The 21’x42’ national flag flies on a 266’ pole above Parliament in Canberra. 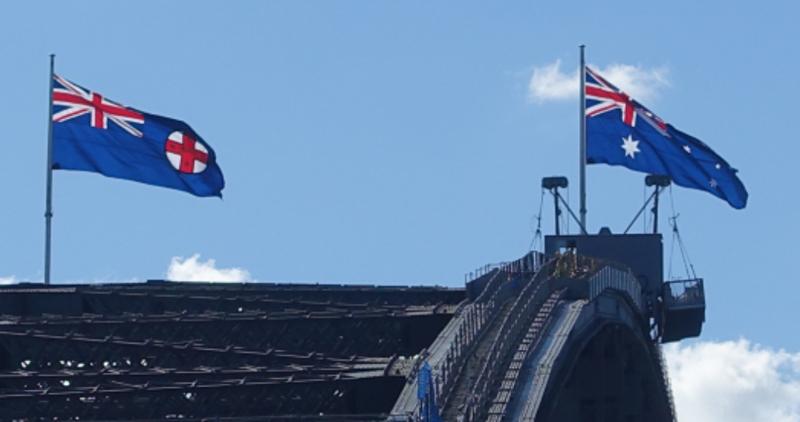 The New South Wales and Australia flags fly on the Sydney Harbor Bridge. 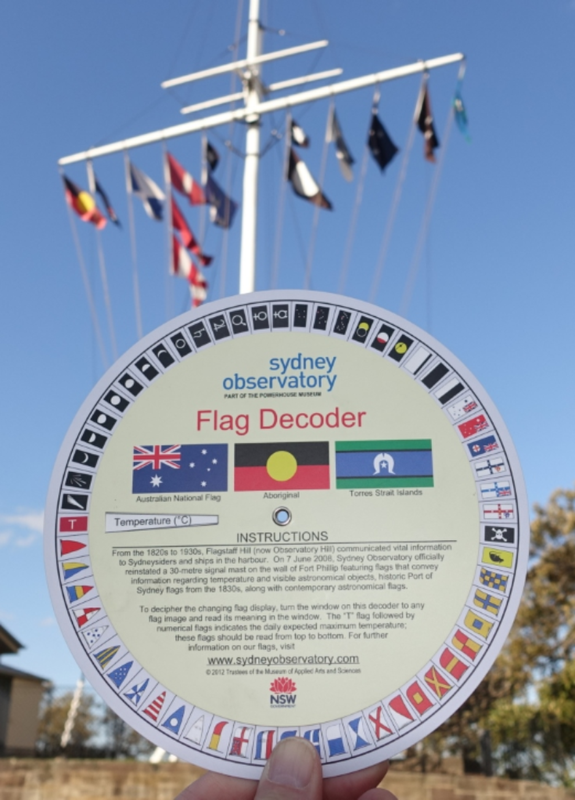 The flagstaff on Sydney’s Observatory Hill provides a decoder to ID the flags. 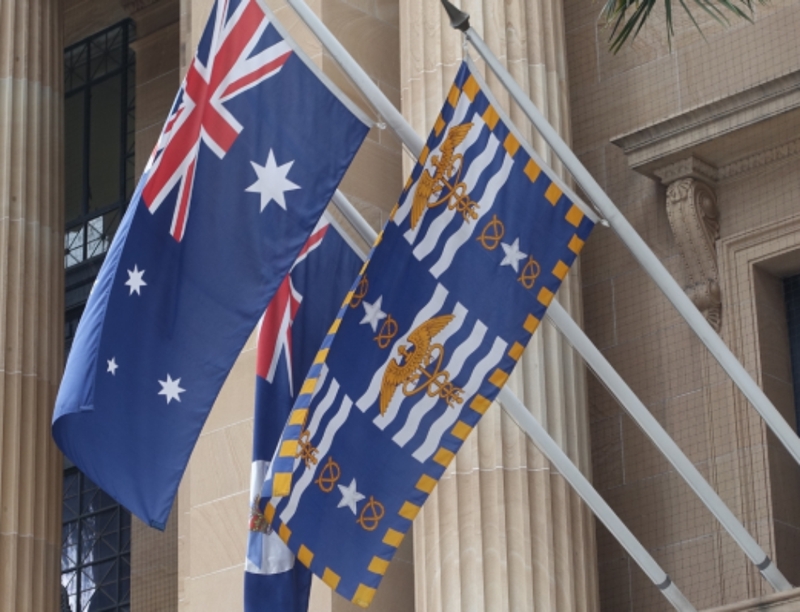 The flags of Australia, Queensland, and Brisbane adorn the city hall there. 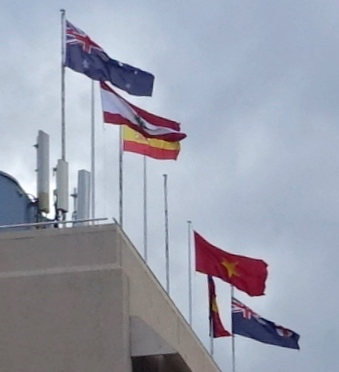 Flags adorn a Sydney hotel—although the Vietnamese flag is upside-down. 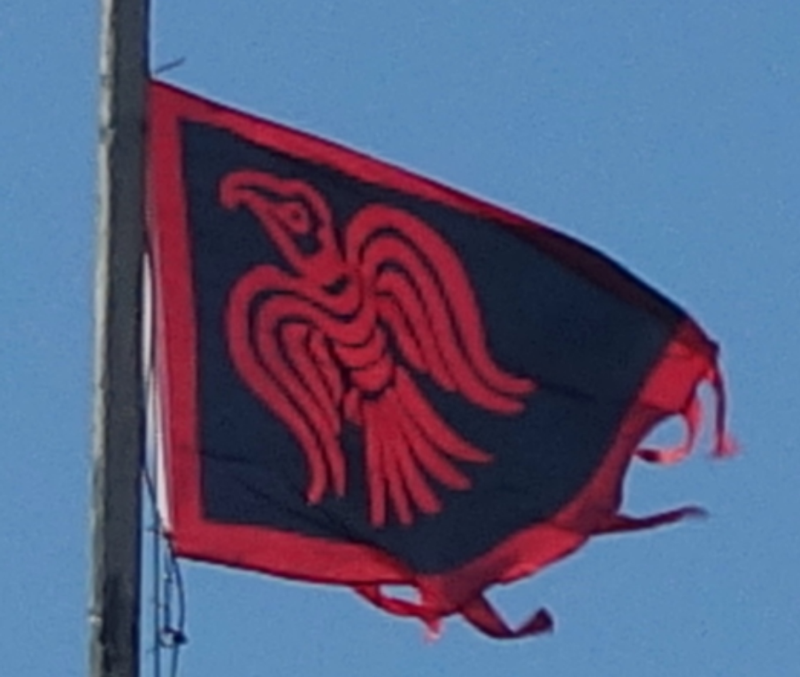 An unexplained Raven flag tops the Beechworth Bakery in Ballarat. 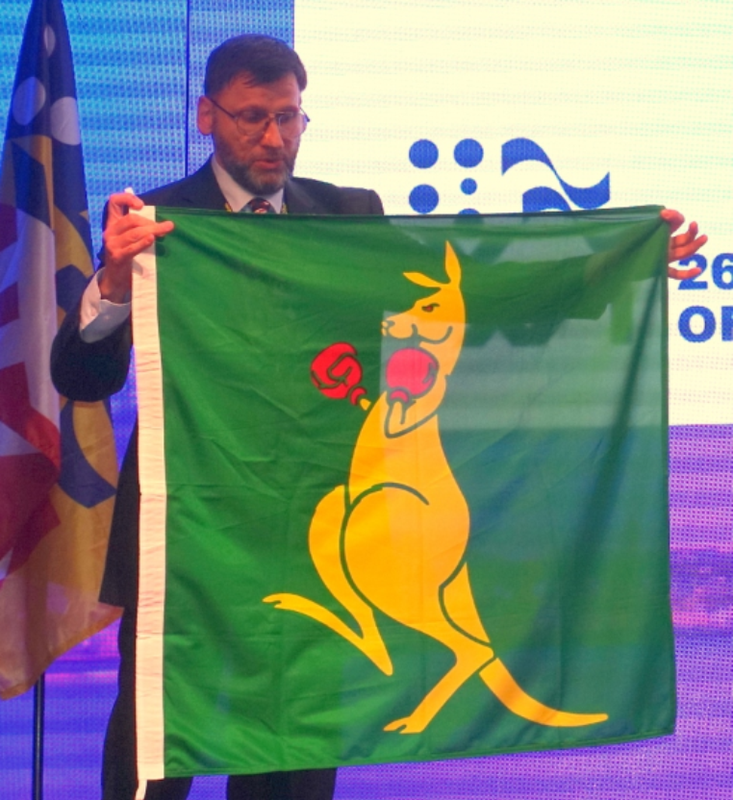 Ralph Bartlett displays an Australian sporting flag in his ICV presentation. Another hotel flies the Aboriginal flag prominently among other nations. 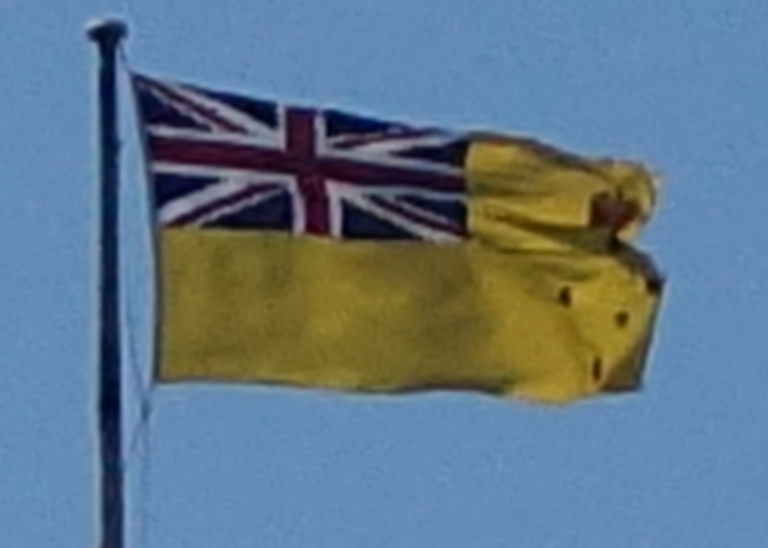 The flag of the governor-general of the state of Victoria uses a yellow field. 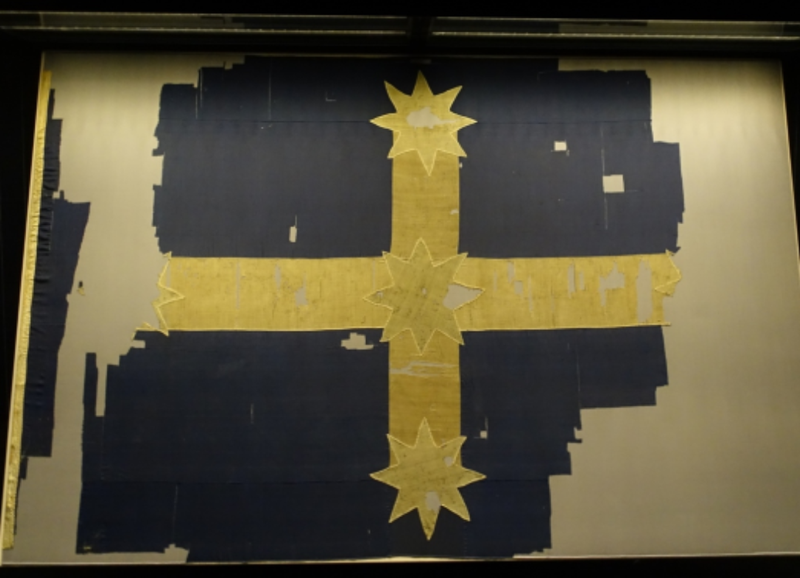 The original Eureka Flag, Australia’s origin flag, is conserved in Ballarat. Long-time PFA member Michael Orelove is recovering from a medical emergency. We will miss having his good-natured enthusiasm at our meetings, and wish him a full and expeditious return to health. Here is a photo essay he put together for our most recent newsletter. When I take a trip, I pack clean underwear, my toothbrush, and some flags. I also pick up more flags along the way. In October Kathleen and I took a 10-day cruise through New England and Canada on a Holland America ship. 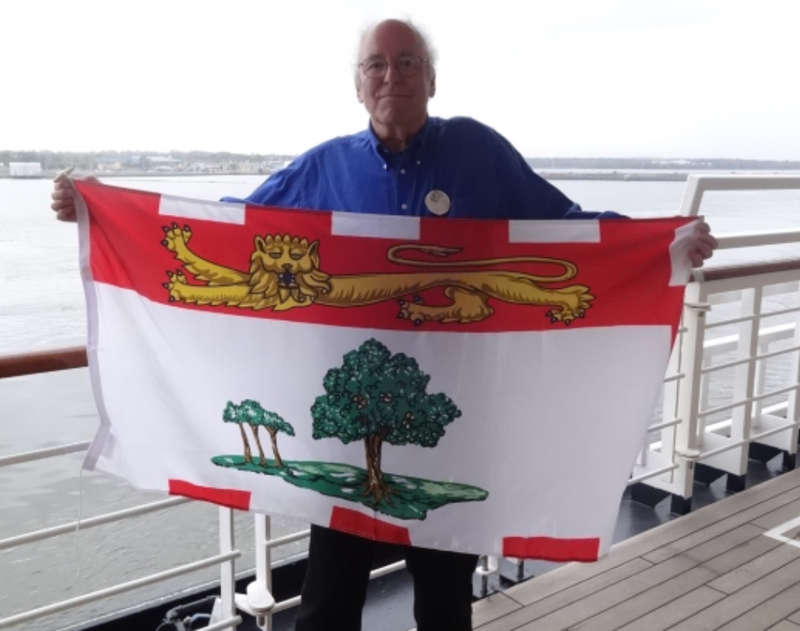 Charlottetown, Prince Edward Island: Prince Edward Island flag…Holland America presented me with the P.E.I.’s provincial flag as we left Charlottetown. 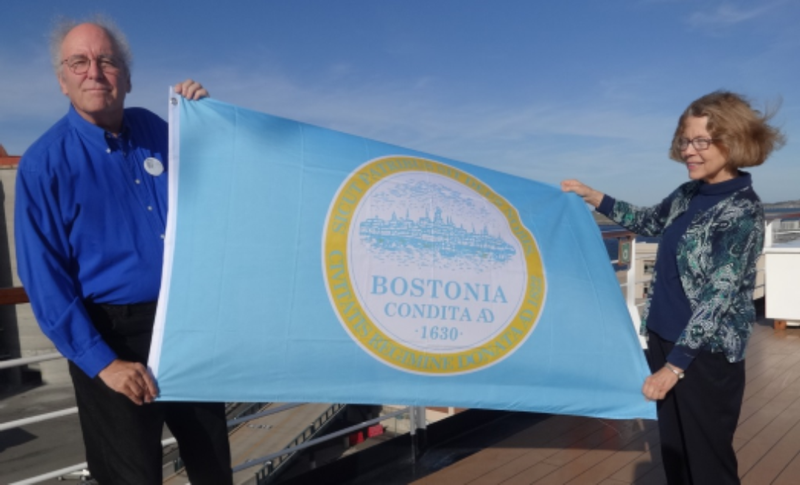 Aboard the Eurodam: Boston city flag…Holland America presented me with a city flag of Boston (or should I say “Bostonia”?) as we sailed away. 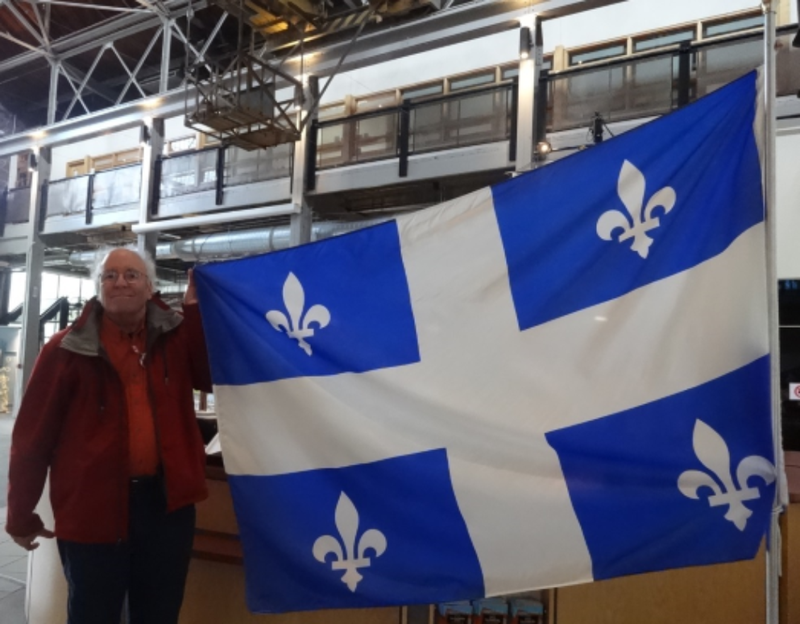 Saguenay, Quebec: Québec flag…Inside the Arthur Villeneuve house museum I spotted a Québec flag flying proudly. 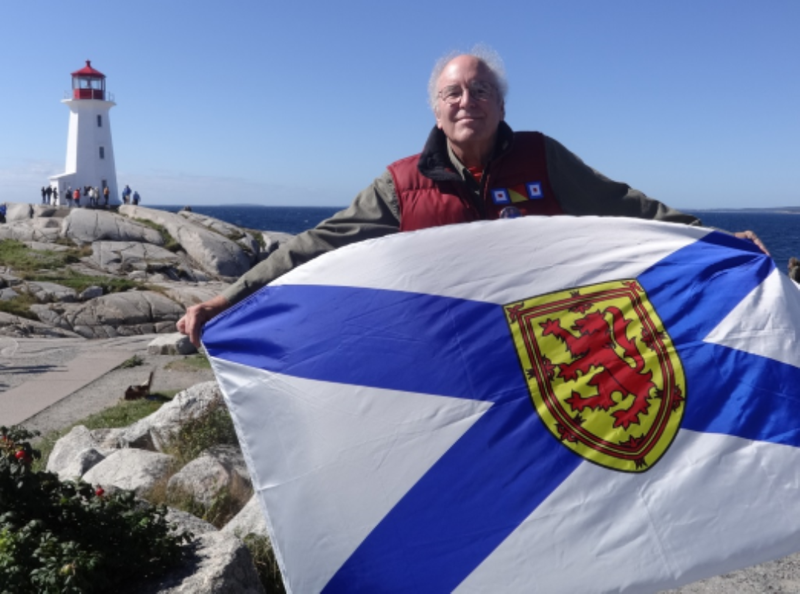 Nova Scotia: Nova Scotia flag…The province has over 160 historic lighthouses. Peggy’s Point Lighthouse is one of Nova Scotia’s best-known lighthouses and may be the most-photographed in Canada. Located in the quaint fishing village of Peggy’s Cove, the lighthouse was built in 1915. Rockland, Maine: Rockland Yacht Club burgee…When we got off the cruise ship in Rockland I saw the Rockland Yacht Club. 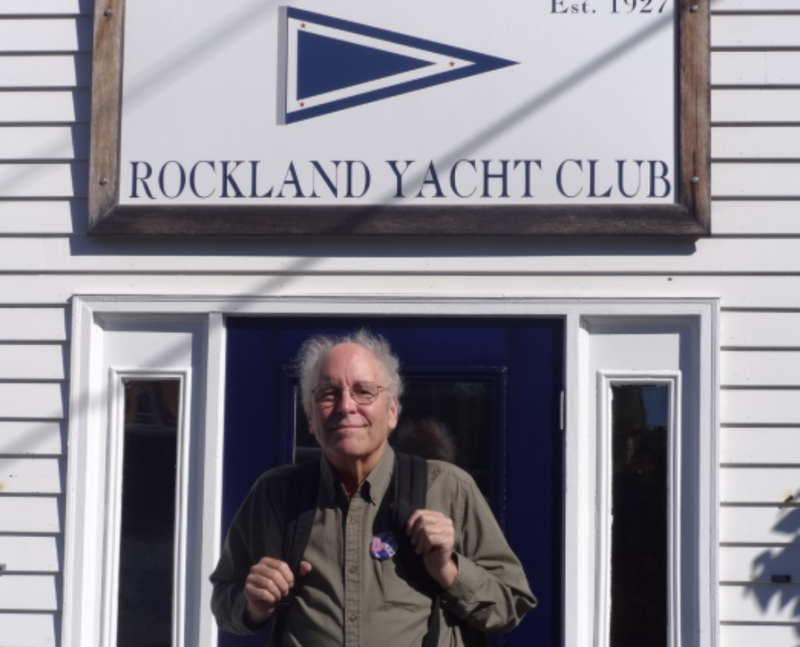 Since I don’t have its burgee, Kathleen took my photo so I could send the club an image with a request for an old burgee. Boston: Portland (Oregon) city flag…The Samuel Adams statue in Boston represents the Revolutionary patriot, clad in the citizen’s dress of the period, standing erect, with folded arms and a determined look in his finely-chiseled face. 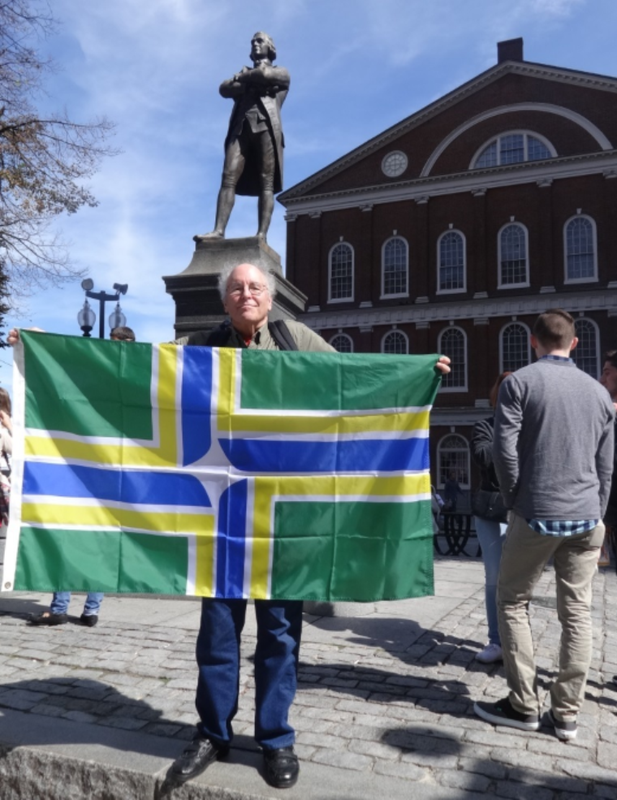 It’s a fitting backdrop for the Portland city flag, given that our last mayor was named Sam Adams. 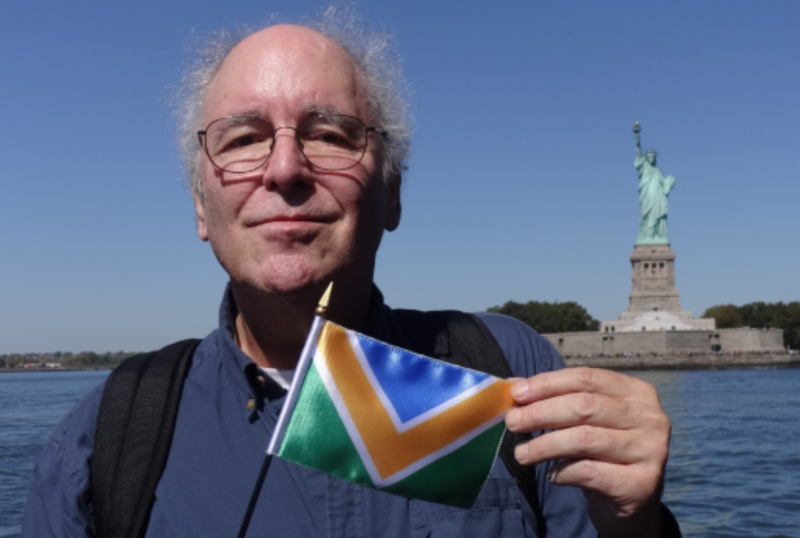 I use the flags that I acquire on these trips, as well as those sent me by governments and other entities, when I give flag talks to school and community groups.